Standing 6' 2" above the ice Ben Eager has always been known for his big body, coming into league and making his physical abilities known immediately. In his first two seasons, he played in 88 games, and spent 251 minutes in the penalty box. 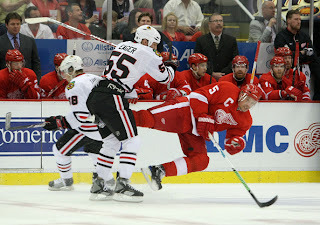 On the other hand, Eager has never found his offensive stride only surpassing the 10 goal mark once, that happening during '08-'09 season with the Chicago Blackhawks.He has scored only 34 goals in 323 games played. But has spent 741 minutes in the penalty box over those 323 games. This low offensive output could possibly be a contributing to his traveling from team to team, having played for the Philadelphia Flyers, Chicago Blackhawks, Atlanta Thrashers, San Jose Sharks, and will be lacing em up for the Edmonton Oilers come time for next season. However, Eager issued a news flash to the NHL that he is more than just a big body when he scored the San Jose Sharks sixth goal against the Dallas Stars. After receiving a pass from fellow grinder Jamal Mayers, Ben Eager received the pass reaching behind his body. After receiving the pass Eager chipped the puck up between his legs and on to his back hand. Eager beat the Dallas defense man and goalie Andrew Raycroft, putting the puck in an empty net.